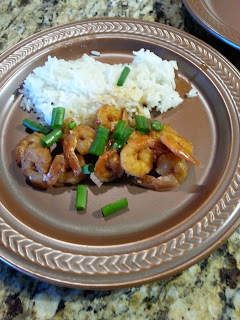 If you like teriyaki sauce you will like this teriyaki shrimp. Place shrimp in a bowl, add teriyaki sauce, sea salt, black pepper and garlic. Cover and marinade in the refrigerator for 15 minutes. Strain shrimp over medium clean bowl, reserve teriyaki sauce. Heat oil in skillet over medium heat.Sear shrimp 1 minute each side. Add teriyaki sauce and cook 5 minutes. Serve with rice. Garnish with chopped green onions.